This brings us to the record player, or should I say “turntable.” There is a difference between the two. “For the record,” a record player is generally thought of as a turntable with a built-in amplifier and speaker(s). 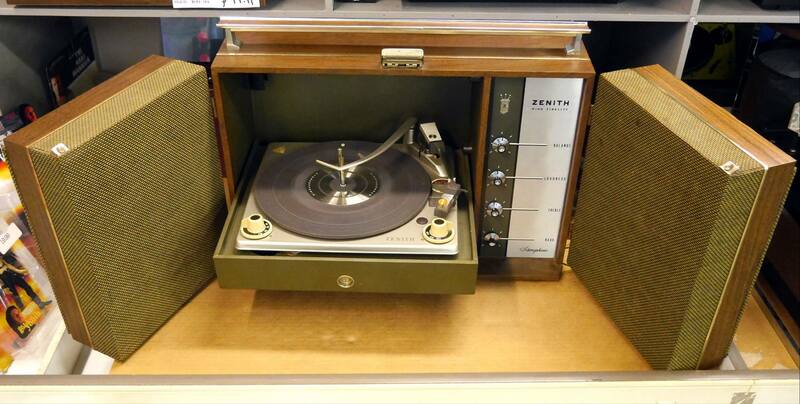 Portable units are typically record players. A turntable is simply just that: a turning table to place the record on, and a pickup device (cartridge and stylus) that fits into the record groove, reads the information on the record, and generates a very small electrical signal to the preamp. (See forthcoming discussion about preamps.) The signal then travels on to the power amp for further amplification, and ultimately sound reproduction via speakers or headphones. For our purposes regarding the Classic Vinyl Listening Experience, let’s assume that we are referring to a turntable that is capable of providing high fidelity sound reproduction. Turntables are considered non-portable devices in that the more expensive and elaborate units require a fair degree of assembly time for setting them up properly and securing them in their place. In a word, turntables are intended to be instruments, but their quality can range from toy-like objects to high precision devices. The resulting sound reproduction ranges from horrible (cheapo-cheapo units) to exquisite (high quality units).